Am I Eligible for an Exemption Under the Affordable Care Act? As we go deeper into tax season, there is a lot of chatter about penalties for not having health insurance, as the CT Mirror recently reported in their article Six things to know about Obamacare and taxes. However, there are exemptions to the individual mandate to have health insurance. 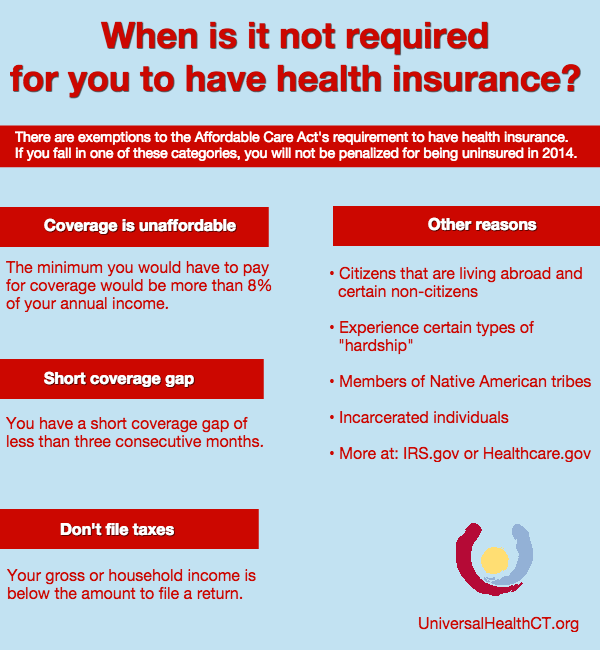 Under certain circumstances, you will not be penalized for being uninsured in 2014. Through Access Health CT or claimed on a tax return. Healthcare.gov also has more information on their page Exemptions from the fee for not having health coverage, with information on how to claim your exemption. This entry was posted in Rosana G. Ferraro and tagged Affordable Care Act, Infographics. Bookmark the permalink. 1 Response to Am I Eligible for an Exemption Under the Affordable Care Act?